Red Sails Inn Restaurant, a landmark eatery for mariners on Shelter Island Drive in San Diego, will close its doors to patrons on Aug. 31. Brigantine Inc. will take over the lease on Sept. 1 with plans to reopen the restaurant as Ketch Grill and Tap. Red Sails to cease operations after lease interest is sold to multimillion-dollar restaurant group. SAN DIEGO — Nothing is forever, not even the original home of The Log. Red Sails Inn, an iconic restaurant and lounge on Shelter Island, could be converted into a more modern dining concept after the Port of San Diego approved a leasehold sale to The Brigantine Inc.
Red Sails, not quite a “dive bar” despite a World War II era dive suit greeting patrons as they pass through the restaurant’s main entrance en route to the bar, has served as a destination for anglers, boatyard workers and mariners in the Shelter Island and Point Loma regions of San Diego since 1957. Within the next few weeks Red Sails will be no more. William O. Roberts started The Log by a dining room fireplace at Red Sails in 1971, a fitting location considering the strong maritime presence on Shelter Island. 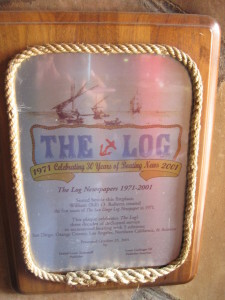 Back then the boating publication was known as San Diego Log. A plaque by the fireplace commemorates Red Sails as The Log’s birthplace. Red Sails owner Bill Dargitz said he was disappointed Brigantine would not continue the restaurant’s tradition. Brigantine takes over the lease on Sept. 1 and, according to Dargitz, will immediately close Red Sails Inn. “From a business standpoint it made the most sense,” Dargitz told The Log, adding he’s helping some of the wait staff find jobs elsewhere since it could be a few months before the new restaurant is up and running, not to mention there are no guarantees Red Sails’ current employees would still have a job with Brigantine. Dargitz added the end of Red Sails is bittersweet. In addition to being a go-to place for mariners Red Sails was also a place where people held wedding recitals or brought their mother to eat each year for Mothers Day. After news of Red Sails’ closure began to spread many customers walked out of the restaurant in tears, according to Dargitz. Once Brigantine takes over Red Sails’ lease on Sept. 1 it will begin converting the restaurant into Ketch Grill and Tap. Dargitz said he had reached out to Brigantine after the port district put the lease of another restaurant out to bid, as opposed to working with the current operator to make upgrades internally. Brigantine, founded in 1969, is a family-owned business and is known for its restaurant development and operation experience and owns 12 restaurants, including its two dining concepts of Brigantine Seafood and Miguel’s Cocina. Taking over Red Sails proved to be a good opportunity for Brigantine to launch a third dining concept – Ketch Grill and Tap – a port district spokesperson told The Log. Brigantine agreed to pay the port district $78,750 annually (up from $67,850 annually) as part of the lease. Port officials are also negotiating with Brigantine to redevelop Anthony’s Fish Grotto restaurant located on the Embarcadero. The changing of the guard of an iconic restaurant at the upper edge of Shelter Island certainly evokes sentimental memories of a time that once was for San Diego’s boating and maritime community. Yacht brokers, boatyard operators, anglers and skippers regularly filled Red Sails’ dining hall and bar. The restaurant, which traces its roots back to an eatery that began operating the end of G Street, originally thrived on the waterfront providing chili and beer to anglers and locals until its closure during WWII. Former owner, Jack Davis, decided to carry over the name to a restaurant he opened in 1957. The new restaurant started out serving lunch, and later added breakfast and dinner, according to a 2010 The Log article. 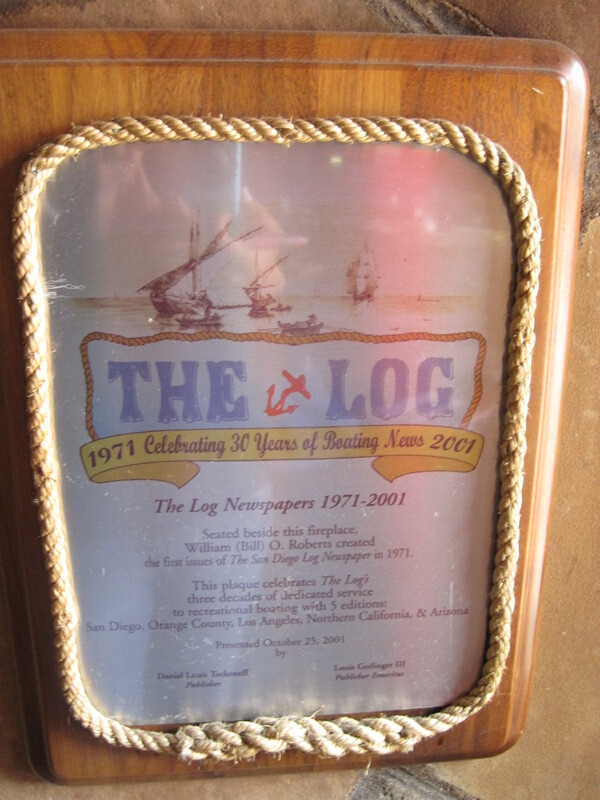 Among the photos of star patrons, black and white pictures of the original fish house and scenes of San Diego is a plaque that shares the story of the beginning of California’s boating newspaper, The Log. 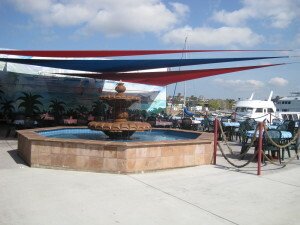 In 2001, the restaurant commemorated the publication’s early years at the Red Sails Inn with the plaque, celebrating its contribution to the boating community in San Diego and Southern California. A former publisher of The Log wrote a column in our 1,000th issue (June 19-July 2, 2015) of how he was first introduced to the publication during a visit to Red Sails. Interviews, copyediting, meetings, personnel decisions and layout for The Log were all done in some capacity at Red Sails in the early 1970s. Capt. Nicole Sours Larson, who pens her Dock Lines column in every issue of The Log, aptly described Red Sails in a March 2015 yarn. “The older Red Sails Inn is a true San Diego waterfront institution, so ‘salty’ that The Log even got its start there in 1971, as a plaque posted near the fireplace attests, before moving next door,” Larson wrote, citing a recollection of Capt. Pat Rains, who also made contributions to the newspaper. Larson continued on about the restaurant’s history, which first started off closer to Downtown San Diego before moving to its Shelter Island location. “The inn, originally founded in the 1920s on the waterfront at the foot of G Street near the current Fish Market Restaurant, moved to its current spot on Shelter Island in 1957,” Larson wrote in her column. She added the restaurant’s owner scheduled happy hour to accommodate the many maritime workers who worked nearby. “It’s a popular destination not just for sailors, boaters and waterfront lovers but also for marine industry workers. Dargitz scheduled his happy hour early, from 2-6 p.m. Monday to Friday, because so many marine workers finish their workday’s mid-afternoon,” she wrote, adding the restaurant’s walls featured historic photographs of San Diego’s seafaring traditions. Red Sails “oozes maritime warmth,” continued Larson. She added Red Sails was a destination for boaters whenever their boats were hauled out at Kettenbergs. “If you were hauled out at Kettenbergs, you ate at Red Sails, period,” said Rains. 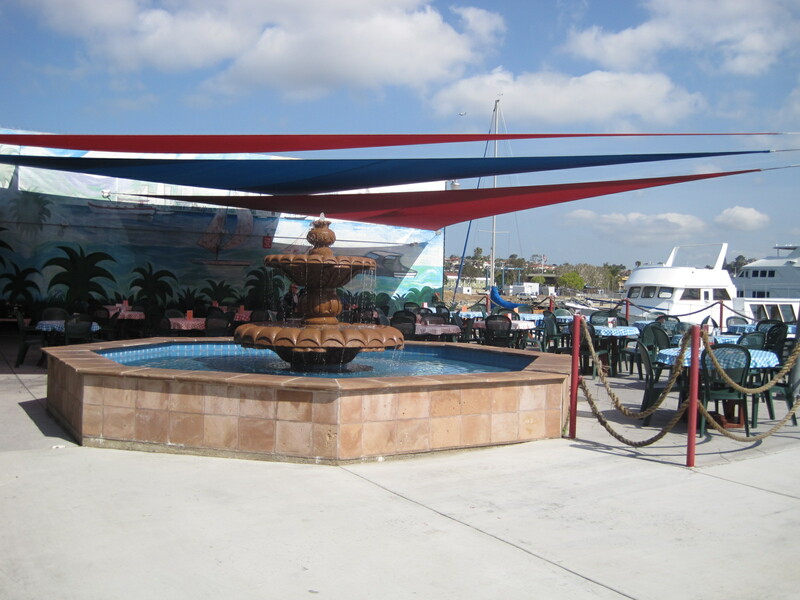 The Mexico boating expert reminisced on what Red Sails meant to the local boating community. 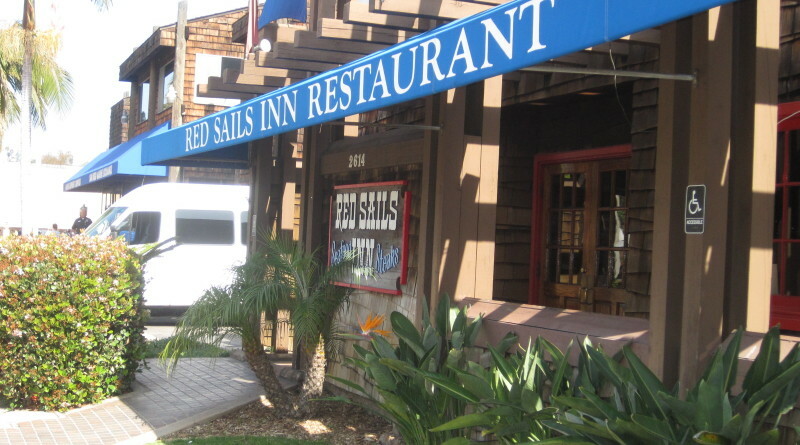 “When I first sailed into San Diego Bay in the early 1980s, Red Sails was just a cozy place to dinghy up and have breakfast before the chandlers opened,” recalled Rains. “The Log Newspaper was housed in a tiny building nearby – but more often than not, the pages were put together on a table in the back of Red Sails. Red Sails will host its final dinner and send off party on Aug. 31. Brigantine hopes the restaurant would be fully remodeled and rebranded as Ketch before the end of the year, though the permitting and licensing process could delay when doors will officially open for the new dining venue. Regardless of when Ketch opens a little piece of boating – and The Log’s – history is sailing off into the sunset.